Mulebone's new record "Keep on Movin'" is out! John and Hugh are a team that "gets it". There's a unique quality to their sound that gets to me...a strong sound that cuts through. It's my feeling Mulebone's gonna be around for a long time. Very satisfying!" "Some of the best blues you're likely to hear this side of 1925. Hugh and John don't just rehash classics from the blues greats, they recreate them as their own, and write originals that fit in seamlessly with that repertoire. The real deal." "At WNKU Our Staff doesn't agree on much, but we do agree that Mulebone is blues for the soul!" "Hugh and John are always a hoot to have in studio and on stage. They have a stripped-down and unique style of Blues that really resonates with our listeners. A Mulebone album is always a welcome arrival at WYCE." "Mulebone takes old blues and folk music into space as well as anyone since Led Zeppelin covered Sonny Boy Williamson." "Bluesville Sessions is a stellar recoding from start to finish." “Jump-out-of-your-seats! 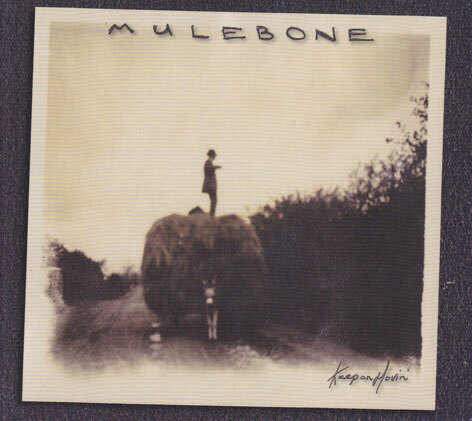 Mulebone is a self-contained showcase of American roots music." "Mulebone offers a unique fusion of traditional roots music with some interesting twists." "Pool is a terrific guitarist, showing off some wonderful equipment to match his playing. He also boasts a charismatic stage persona." "Multi-instrumentalist John Ragusa used unexpected choices for accompaniment, including several flutes, mouth harp, and an amplified conch shell. This unorthodox setup made for some exciting takes on old blues tunes." "Fans of the blues should not fret about the future of their beloved music (with) Mulebone’s pleasantly bizarre choice of instrumentation modern blues appears to be in the best of hands."